What Do Shrink-Wrapped Thanksgiving Turkeys and the Higgs Boson Have in Common? Both can be made using the power of particle accelerators. Frozen turkeys and thermal grocery bags filled with food items sit ready for distribution at the Dover Air Force Base, Del. 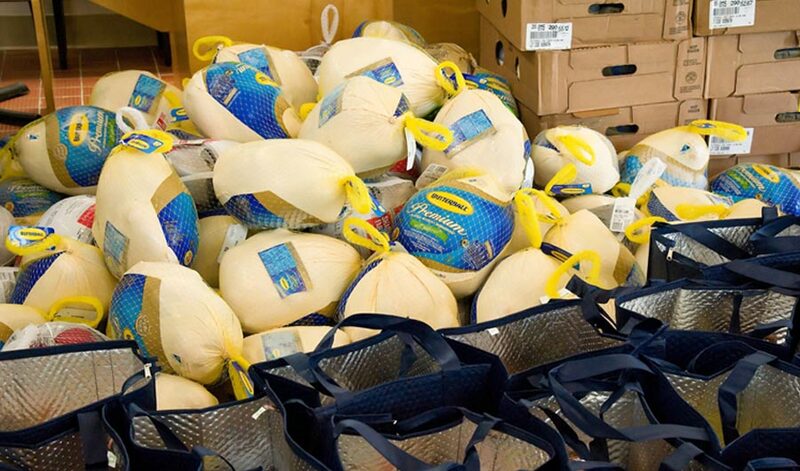 (Inside Science) -- Each Thanksgiving, millions of Americans tote turkeys home from the store. If you find yourself plopping a fresh, shrink-wrapped bird into your cart, you can thank particle physicists for the sturdy, shelf life-extending packaging. That's because the food industry makes shrink wrap using a tool first developed in physics labs: an electron accelerator. To understand how the process works, imagine the atoms in the plastic as individuals at a large Thanksgiving dinner. Initially these people only hang out with others they already know, or the family members they know they like. (In shrink wrap, the "in-groups" are long strings of bonded atoms called polymer chains.) This initial configuration is weak, since the groups easily drift apart. Now imagine an accelerated electron as an expert Thanksgiving host. It can zip through the gathering and break apart conversations, encouraging people to shake hands with others in different groups. The technical name for this process in plastics is cross-linking. It makes the plastic tougher and more heat-resistant. Cross-linking is essential for making shrink wrap because it allows manufacturers to heat the plastic and stretch it into a thin film without it breaking or melting into a mess. When the film is cooled it retains the stretched-out shape. But make the film into a bag, drop a turkey (or other item) inside and reheat it, and the plastic will shrink, creating a tight seal with whatever is inside. The plastic industry serves up a hearty helping of shrink wrap each year. And it's just a tiny portion of the overall market for industrial particle accelerators, which are also used to cross-link the protective plastic around electrical wiring, sterilize medical equipment and enhance the color of gemstones. Industrial machines are cheaper and less powerful than famous particle accelerators such as the massive Large Hadron Collider in Europe, which physicists used in 2012 to confirm the existence of a particle called the Higgs boson. But industry accelerators represent a tangible way particle physics touches everyday life, and their applications are still expanding. "Electron beams have the potential to treat wastewater, pave better roads and add to the flourishing and wealth of the modern economy," said Charles Thangaraj, an accelerator physicist at Fermilab’s Illinois Accelerator Research Center located outside of Chicago, which helps to transfer accelerator technologies developed at the lab to industry applications. So, this Thanksgiving, as you pop your turkey out of its form-fitting plastic sheath, consider taking a moment to give thanks for the physics that makes it possible. Editor's Note: This article was updated on Nov. 20, 2018 at 2:00 PM to clarify Charles Thangaraj's position at Fermilab.